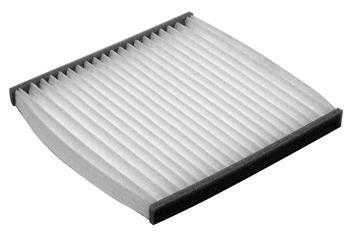 DENSO Cabin Air Filter - Dezod Motorsports Inc - Home of the automotive performance enthusiast since 2002. A relatively new feature on the automotive scene, the cabin air filter is often overlooked in regular vehicle maintenance. That’s unfortunate, because the cabin air filter is just as important to the passengers as the engine air filter is to the vehicle. A cabin filter processes the air that enters the passenger compartment via the vehicle’s heating and air conditioning system, increasing passenger comfort by trapping particulates, pollen, and other irritants. For people with allergies and other sensitivities to airborne agents, the cabin filter represents a significant advance. Replacing the cabin air filter at the recommended interval, or sooner in areas where soot or pollen are prevalent, allows the passengers to breathe cleaner, fresher air – which makes any journey more enjoyable. DENSO First Time Fit® replacement cabin filters are engineered for optimal airflow and filtration, meeting all OE requirements to the letter. Up to five layers of filter media are used to trap impurities down to just .001 micron in size. Just as with engine air filters, some discount suppliers are known to cut corners on quality to save a few cents. A cut-rate price may turn out to be no bargain. What consumers really want is value, and DENSO First Time Fit® cabin air filters deliver it.